Although there seems to be no orbital Hasselblad Apollo-photographs of Agrippa itself (close ups), Apollo 16's Metric/Mapping Fairchild camera made a series of interesting oblique northward-looking photographs of the region south of Agrippa, with Agrippa itself near (or "below") the curved horizon. AS16-M-0836 is one of those photographs, with Agrippa slightly rightward and below the horizon's central part. The crater just below (to the south of) Agrippa is Godin. See also Apollo 16's AS16-M-1399, which shows the same view as in the above mentioned AS16-M-0836, but... the sun's higher in the sky. Apollo 17's Metric/Mapping Fairchild camera also made a series of oblique photographs which show Agrippa. One of them, AS17-M-1668, shows a southward-looking view with distant Agrippa very near the curved horizon (the central part of the horizon). Careful investigation of Apollo 12's orbital Hasselblad photographs reveals a neat oblique (high-sun) look at Agrippa. 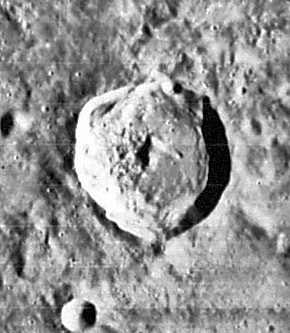 See: AS12-52-7723 (Agrippa is the large crater near the frame's upper left corner, Lade near the frame's upper right corner, and Godin in between them). (IAU Directions) AGRIPPA.--A ring-plain 28 miles in diameter on the N. of Godin, with a terraced border rising to a height of between 7,000 and 8,000 feet above the floor, which contains a large bright central mountain and two craters on the S. The shape of this formation deviates very considerably from circularity, the N. wall, on which stands a small crater, being almost lineal. On the E., at a distance of a few miles, runs the prominent mountain range, extending northwards nearly up to the W. flank of Julius Caesar, which bounds the W. side of the great Ariadaeus plain. Between this rocky barrier and Agrippa is a very noteworthy enclosure containing much minute detail and a long straight ridge resembling a cleft. A few miles N. of Agrippa stands a small crater; at a point E. of which the Hyginus cleft originates. Lunar Base Site: One of the early papers describing lunar bases proposed that a site near Agrippa would be ideal. Included in ALPO list of bright ray craters. Radar bright at both 3.8 cm and 70 cm, implying that it is young (consistent with rays). The name Agrippa is from G.B.Riccioli (see page 210 in E.A.Whitaker's Mapping and Naming the Moon). Named for Agrippa (unkn-fl. 92 AD), a Greek astronomer. The only thing that is known about him regards an astronomical observation that he made in 92 AD, which is cited by Ptolemy. Hill, Harold. 1991. A Portfolio of Lunar Drawings., page 4 (the Ariadaeus rille at sunset). This page was last edited on 16 April 2018, at 20:09.